This natural wave bundle uses top Malaysian virgin human hair, whose cuticles are full and facing the same direction. The hair is cut from one healthy single donor, to keep the original condition of the Malaysian hair, we never use chemical on it, the wave pattern is in its natural state once the hair is cut from the donor. We suggest you take good care of the natural wave hair if you want the hair to last long, even the hair could keep its wave shape for a long time. 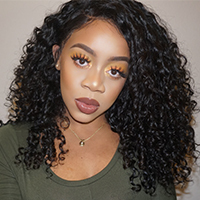 Virgin hair extensions are very useful for women who have thin hair, not only the hair could be worn for a long time, but it also could be colored and bleached. You can use our virgin hair extensions to achieve any hair styles you like, it will perfectly blend with your natural hair and look beautiful. I love how this hair curls, it is so beautiful and soft. The packaging is so protective and it got here in like 4 days omg! I definitely will be buying from here in the future. I normally don’t leave reviews, but this one is deserved. I have had this hair installed for 3 weeks now. It is the best hair I’ve ordered on Ali Express. I love the wet and curly look. I had straightened it initially when I had it installed which was ok for a couple of days. This hair is not made to be straight. What. really impressed me was when I washed it. It did not tangle and was super soft. I will be ordering from this vendor again. Thanks.